Goodreads: At the end of a long winter, in bucolic Ridgedale, New Jersey, the body of an infant is discovered in the woods near the town’s prestigious university campus. No one knows who the baby is, or how her body ended up out there. But there is no shortage of opinions. When freelance journalist, and recent Ridgedale transplant, Molly Anderson is unexpectedly called upon to cover the story for the Ridegdale Reader, it’s a risk, given the severe depression that followed the loss of her own baby. But the bigger threat comes when Molly unearths some of Ridgedale’s darkest secrets, including a string of unreported sexual assaults that goes back twenty years. Meanwhile, Sandy, a high school dropout, searches for her volatile and now missing mother, and PTA president Barbara struggles to help her young son, who’s suddenly having disturbing outbursts. Kritters Thoughts: Three women in a small town in New Jersey and an infant is found dead in the woods, a who dun it is on in this small town where everyone thinks they know everyone and everything. Molly is a woman who is trying to put the pieces back together and has been working on the local newspaper and the infant in the woods is her first story beyond her stints in the arts section. Barbara is the perfect mom in the neighborhood with two kids and lots of opinions. Sandy is a teenager who has recently moved back with her mom and I don't want to divulge too much about her - you will have to read! With news articles, comments, journals, chat rooms and the novel - this book was so good and full. Sometimes I find when there are extra things that they take away from the content of the book, but they were so perfectly put in and completely added to the story. The one thing that had me concerned was the amount of characters that seemed guilty. I felt like almost every character felt guilty and I didn't love it - I was second guessing the honesty of EVERY character and that was a little exhausting. I did love the ending, but I did guess who dun it quite early, but I still wasn't disappointed! 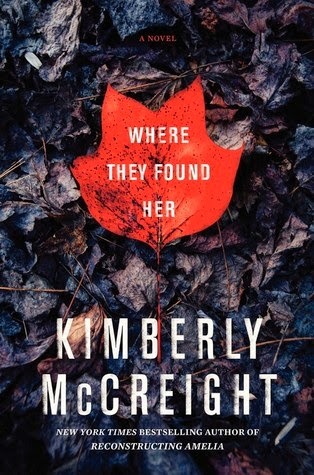 This is my first experience of Kimberly McCreight, but definitely not my last. I will definitely be looking into her backlist. I'm glad you enjoyed this one! Thanks for being a part of the tour. I just finished this as well and really enjoyed it!